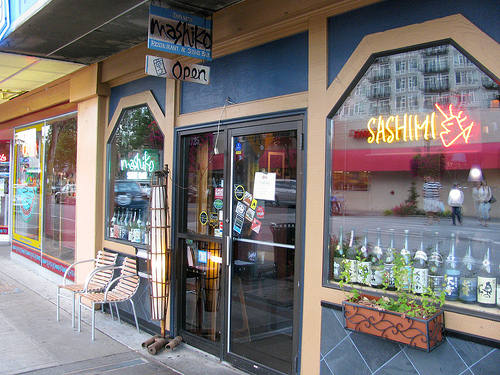 Mashiko store front in West Seattle. It’s another exciting month of events at Dianasaur Dishes. I’m still putting together video from our Artisan Steak Tasting, Tuesday I get to dine at Springhill in Seattle at a special Foodbuzz table, and I almost have all the photos edited of our fun filled farm tour with our friends’ toddlers. But today, I get to share with you the latest event sponsored by Foodbuzz (and brought us by VISA Signature). That’s right, I got another 24, 24, 24 proposal accepted, and so Eric and I got to experience omakase at Mashiko, the very first sustainable seafood sushi restaurant in Seattle. I spent 9 whole hours editing the video below, last night was a late night! 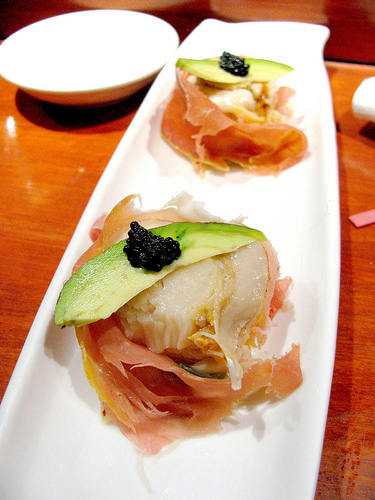 It’s an overview of omakase, Mashiko, and sustainable sushi. Then you can read on for more information and drool over the photos of the best meal I’ve ever had! 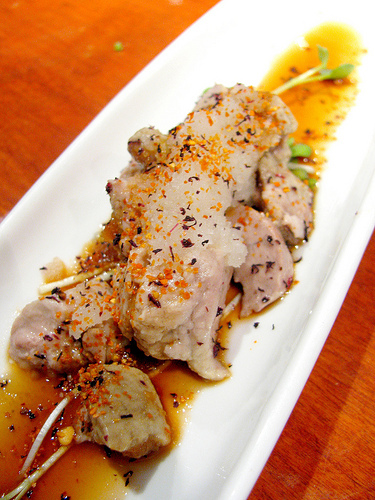 Omakase means “entrust” when translated, and basically means to trust the chef to choose what to serve you. There is typically a higher cost associated with omakase (I’ve seen it at up to $200 a person in some restaurants), which brings with it an expectation of quality food (both ingredients and presentation) as well as attentiveness from the chef. It’s supposed to be a meal that you’ll never forget, that leaves you satisfied and intrigued. 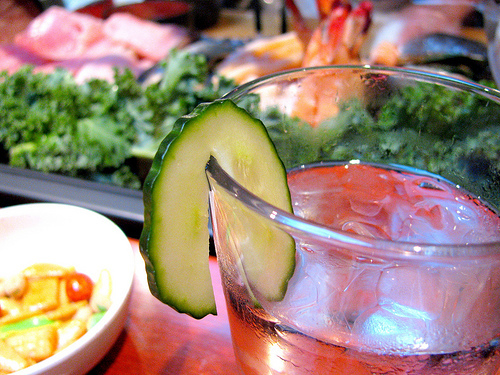 At Mashiko, even the water gets special treatment. 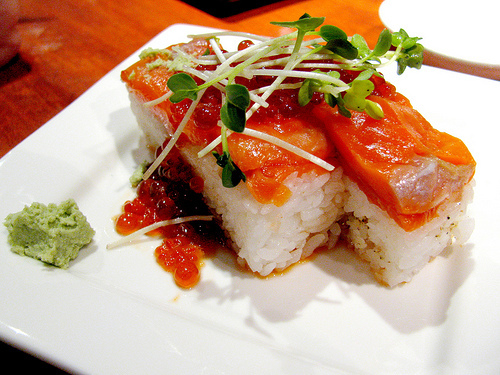 I first heard of omakase in Hawaii, where sushi was a very normal part of the culture. Grocery stores had their own sushi chefs (I was so disappointed the first time I bought grocery store sushi on the mainland! ), there are places like the Texas Rock and Roll Sushi Bar which combine sushi with other food cultures, and I had 4 takeout sushi restaurants within a 10 minute walk from my apartment. But omakase was the unattainable height of perfection to me, the haute couture of sushi I suppose. I would gaze longingly at its listing on a menu, or try not to be envious as my affluent friends spoke of the amazing array of dishes they experienced the night before. I’d dream of a day I too could afford to smile knowingly at the sushi chef and casually murmur “Omakase onegai” across the bar. b: of or relating to a lifestyle involving the use of sustainable methods (sustainable society). Casson Trenor explains in great depth how sustainability relates to seafood, but there are several dimensions to what makes a fish or sea creature sustainable. Just a few of them are how the fish was caught or raised, if the manner it’s farmed or caught is a danger to other species, and if it can reproduce quickly enough to not be depleted. I first heard of Hajime Sato because of his decision to switch entirely to sustainable seafood this year. I couldn’t pass up a chance to not only experience omakase, but also know I was eating sustainably while getting to chat with the chef who made such a gutsy decision. I emailed back and forth with Hajime in the past couple weeks, and he graciously gave me permission to take photos and video during our meal. He also said to make sure I request his side of the bar for our reservation, to make sure that I could ask all the questions I wanted. I was so excited to meet him in person, especially after the amusing videos he did on his website. Hajime’s sense of humor is evident at Mashiko. If you visit Mashiko’s website, you get an idea of Hajime’s personality. He’s a really funny guy who likes to laugh and enjoys silly things like a toothpick bird (which Eric was stoked to finally see in real life after hearing about it on one of his favorite podcasts) and The Onion (available in the men’s restroom for reading material. The women’s restroom is rather famous for having an electronic Japanese seat that’s heated and has settings for bidet, shower, and drying your okole (that’s your bum!). His sense of humor is also evident in signs all around the restaurant. Hajime Sato takes sustainable seafood seriously. 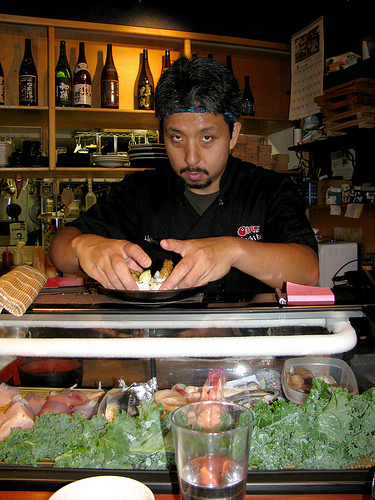 But when it comes to sustainable seafood, Hajime is incredibly serious. For years he has taught about seafood (including sustainability) at Uwajimaya, but when he was at a sustainable sushi dinner and presentation put on by Casson Trenor, he felt like a failure for daily serving seafood at his restaurant that he knew was heading towards extinction. He passionately declared that he would make his menu entirely sustainable in 3 months. When he began to research his plan, he realized that this meant starting from scratch. He’s learned that a lot of sources lie about where their seafood comes from in order to jump on the sustainable bandwagon. He does extensive research to ensure that the seafood he uses truly comes from sustainable sources, whether it a special coho farm with currents for the fish to swim against, or a cleverly designed line in Hawaii that prevents hurting birds or by catching. He also builds relationships with sustainability experts and is very active in the world of sustainable seafood. 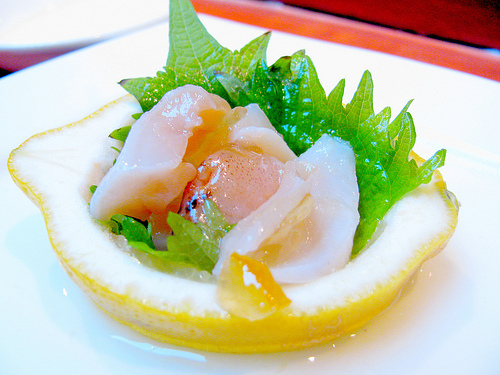 Second course: Raw oyster with ponzu and grated daikon. Our absolute favorite! Hajime said that most people who come to his restaurant don’t even notice the change. People who stick with California rolls can still get basic (non-adventurous) sushi fare. People who like the exotic and exciting dishes can still get a lot of those. But people who love unagi (eel) or spider rolls, or want bluefin tuna (like the man next to Eric who couldn’t believe they didn’t have any) notice a difference. One customer even told Hajime he was a stuck up elitist before storming out. But Hajime sticks to his guns. Third Course: Oysters are grilled this time, and mine was hot! 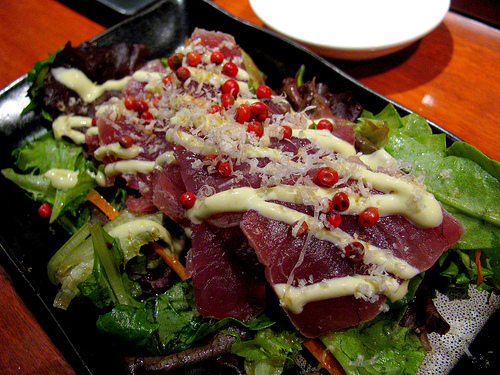 “I’m not saying you can’t EVER eat toro”, says Hajime regarding the highly endangered bluefin tuna. “I’m just saying don’t eat it right now. I love toro, and I’m not eating it, so that I can hopefully eat it again 5 years from now.” Even the people in the seafood industry know that their practices can’t last. Hajime asked an unagi rancher, who catches eel while they’re young andbefore they can reproduce, how much longer they think their business would be around. They answered that it would be less than 10 years before the eel are gone. But right now, there’s a demand and they can make money, so their point of view is stuck in the typical instant gratification desire of humanity. Fourth Course: Rockfish with homemade ponzu and an infused oil. “Every fish here has a story”, Hajime remarks, sweeping an arm to indicate the seafood case. “I pick them, and I can track the source, I can tell you exactly where it comes from.” For instance, he informs those of us seated at the bar that rockfish are endangered. “So why am I serving them?” It turns out that rockfish are often caught as a by product of fishing for other creatures, they die and are thrown out. So Hajime “rescues” these rockfish by keeping their capture and death from being in vain. He gets his scallops all the way from Japan, where they are farmed sustainably rather than scraped from the sea floor, though he looks forward to the new scallop farms in the Pacific Northwest being stable enough for him to source from one day. He tries to prevent waste in other ways as well, like using the entire body of a sea scallop, including the muscle which is not usually attached. Personally, we thought the whole scallop was delicious and didn’t understand why it’s not normally eaten that way, except perhaps that it’s more symmetrical with the muscle removed. Hajime is also a truly talented chef. As we savored each bite, we noticed different dishes hitting our tongue in different places. The scallops were soft and tender, the flavor hitting the back of my tongue like a karate chop, with a smooth salty lingering taste moving toward the tip of it. The skipjack tuna was medley of textures, the tuna so tender and creamy it actually did melt away in my mouth (I know, I hate it when people say that!) as each bite crunched with the firecracker pop of pink peppercorns. Eighth course: salmon with marinated salmon eggs and real wasabi! 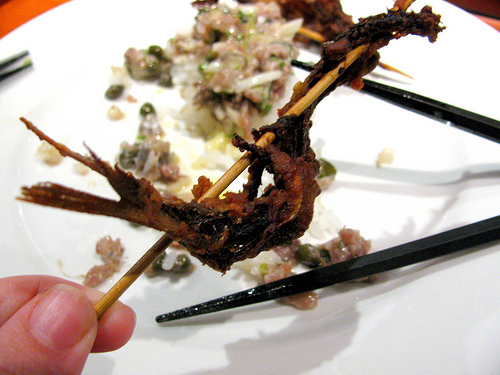 The fried sardine from the ninth course. 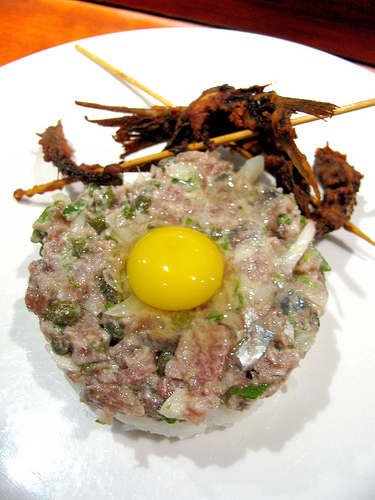 Ninth course: sardine tartare and quail egg with fried sardines. We also learned that albacore is AMAZING, and it’s local and affordable, so I’ll definitely be looking for it to see what I can prepare with it. It’s pole caught and totally sustainable, we liked it better than the tuna! 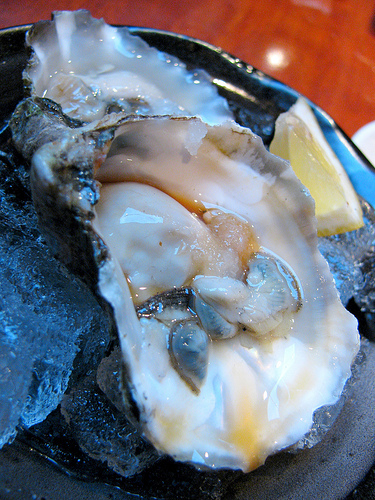 We also learned that geoduck (which you pronounce gooey duck) is crunchy like a firm cucumber, and that the freshest of oysters taste like the spray of ocean waves, then as they slip into your mouth you become certain that there is a reason they’re considered an aphrodisiac. 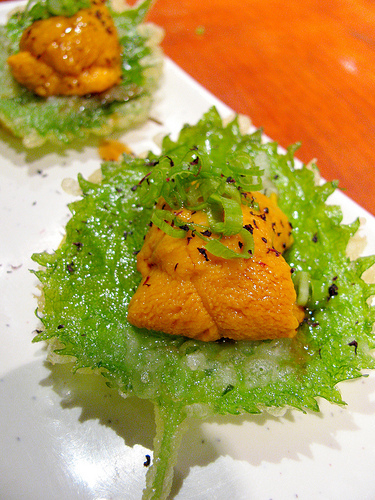 We also really enjoyed the uni, or sea urchin. Hajime said that it’s unfortunate more people don’t like uni, and if they’re had a bad experience with it, it’s the chef’s fault, not the uni’s! Notice, I don’t have a picture of every course up here, unfortunately I don’t have the steadiest hands and in low restaurant light, some were just too blurry to post. But, the last course (which of course I didn’t get a good picture of) was one of the biggest surprises. He served us namagi, at which point we asked “What is namagi?”. It’s catfish, which normally people have an aversion to eating because they’re bottom feeders. But these catfish are from north Carolina, where they’re sustainably farmed and their water is carefully managed to prevent them from eating the things that create that muddy flavor you typically expect. The namagi rolls were very similar to unagi, or eel, which I admit is one of my favorites (partly because I LOVE kabayaki sauce). But Hajime went one better than kabayaki sauce. In the interest of wasting nothing, he used the leftover parts of the black cod to make a sweet stock that simmers for days. Yes, it’s similar to unagi and kabayaki, but both the flavor and environmental impact are out of this world! Hajime has really worked hard to find tasty new creations that are comparable to unsustainable favorites. Even the black cod liver pate, which is so rich it coats your tongue with flavor and lingers in the back of your throat, is similar to the very popular and unsustainable monkfish liver pate. So the bottom line is, sustainable seafood is the way to go. It’s a little more expensive for some items, but if you want to be eating seafood ten years from now, and want your children or grandchildren to be able to, it’s time to make some changes! Check out the Monterey Bay Aquarium for a great seafood buying guide that you can take to the grocery store. 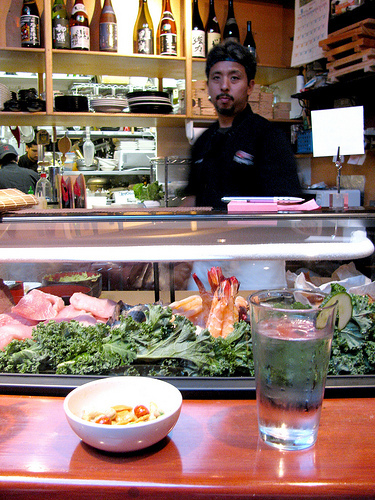 Oh, and go get omakase at Mashiko! It was way more affordable than I expected, and a meal I will always remember. In fact at the end of the 14 course meal, as we walked out the door with swag bags from Hajime, I literally felt like I was on a spiritual and emotional high. If you haven’t experienced a meal like that, I’m sure it sounds silly, but I love sushi, I love learning, and I love doing the right thing. Plus I experienced it all with Eric who deeply enjoyed the food, and participated in the conversation. It was truly a perfect night and we will definitely be back. Thank you to Hajime, Foodbuzz, and all of you for making this possible. Sounds like a fabulous experience! All of the dishes look superb and how great that they use sustainable seafood! That sounds amazing, you are such an eloquent writer and the pictures are fabulous. That restaurant is close to where I live, I’ll have to check it out! Wow. Stunning photos and food. It’s so great to read about places that are embracing sustainable seafood. Great post! If I’m ever in Seattle I’m putting this place on my list. Wow!!! Awesome 24 post. All those dishes look absolutely wonderful!!! I got a craving for sushi all of the sudden. The dish presentations are really nice. This is a perfect way to enjoy sushi. Good to know about this place. It looks absolutely delicious. 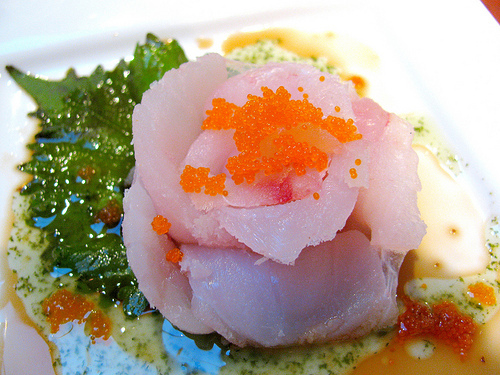 Your pictures are fabulous… truly showcases the beauty of omakase sushi. 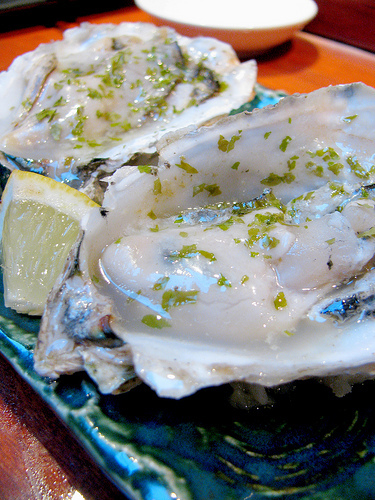 I am totally craving those oysters!!! Yum!!! What a fun video! Mashiko has been on my to-try list for awhile. 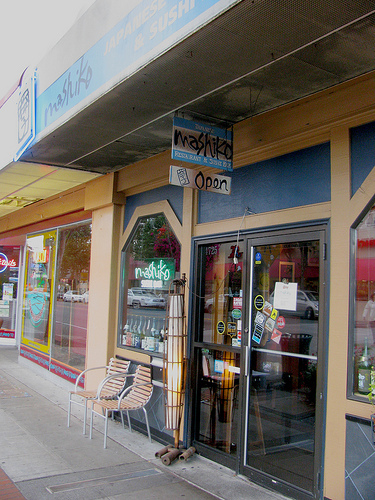 Judging by the photos, it looked ten times better than the omakase I recently had in Ballard. I’m more tempted than ever to make the trek. Thank you for such an informative post. Oh wow, this looks absolutely divine. Congrats! Sounds like a wonderful experience. I came back to Seattle a few months ago after years of being away and am excited to rediscover its food scene. DId the foodbuzz Seattle dinner happen already? I was hoping to be able to attend. Looks fabulous and I think its great that there is a movement for sustainability in sushi. As a sushi lover, I would love for that trend to me widespread. Also, I agree that supermarket sushi can be rather nasty in mainland stores (not that I’ve been to Hawaii or anything). Really wonderful post. I wish I could have been there to join in the omakase fun. There’s no good sushi here in Kuching, and I very much doubt sustainable sushi has caught on anywhere in Malaysia. So I’ll just have to enjoy sustainable sushi vicariously through your post. That guy seems so cool! I loved reading about his views on sustainability… and of course looking at all the drool-worthy sushi pics! 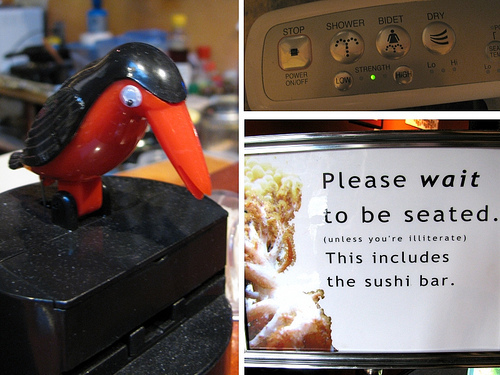 I’m a hard-core unagi fan, but even I could maybe give it up for some of that sea urchin… Yum! That is an amazing omakase, I really like the way the food was combined together creatively to give new tastes and textures. I am so happy that you featured him here. We call Mashiko our second home, kitchen. My happy place. The food is always awesome. The staff and Hajime became part of our family. We always have the Omakase. Whenever we have guests who like sushi, seafood we take them there and now Mashiko has fans from many parts of the US and Europe!